More proof that a great game doesn't need massive texture packs and hours of full motion video. 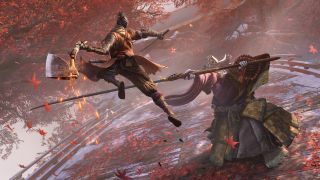 Everyone's been talking about Sekiro, how hard it is, how it trains you to become better at its combat and systems, and more. But let me step back for a minute and point out something I love about the game. The entirety of Sekiro is only a 12.6GB download in Steam, 15.5GB after it's unpacked and installed. From Software axes a lot of the bloat seen in other major games by avoiding long video cutscenes. There's still an intro video, but once that's over, as far as I can tell (I'm not very far in the game) everything is done via in-engine scenes. Considering how much space video can consume, I appreciate this. It's not like Sekiro loses atmospheric points by dropping video either. There are still full voiceovers for everything important, in multiple languages. I'm a heathen and prefer hearing things in English, but the option to go with Japanese audio and English subtitles feels compelling. And there are still plenty of cutscenes, with depth of field used to good effect. They're just not videos. The environments of Sekiro still look beautiful as well, even without a 50GB HD texture pack. (Final Fantasy 15, I'm looking at you.) Sure, things could look a bit better with higher resolution textures, but so far I haven't felt anything was missing. Except an easy mode. Downloading the entire game on my 300Mbps connection only takes about six minutes. And then I can commence dying, a lot. But not before I'm greeted by an EULA (End User Licensing Agreement) that I have to scroll through, line by line, before I can accept it. I still didn't read the EULA. Anyway, I'm not saying every game needs to be like Sekiro. There's room in this world for all types. I'm just saying it's a nice change of pace to get a game that could theoretically fit in my system RAM. Of course, Sekiro does screw up elsewhere—seriously, stop building games with a 60fps cap and no FOV slider. I know that can be fixed with mods, but it never should have happened in the first place, not in 2019.